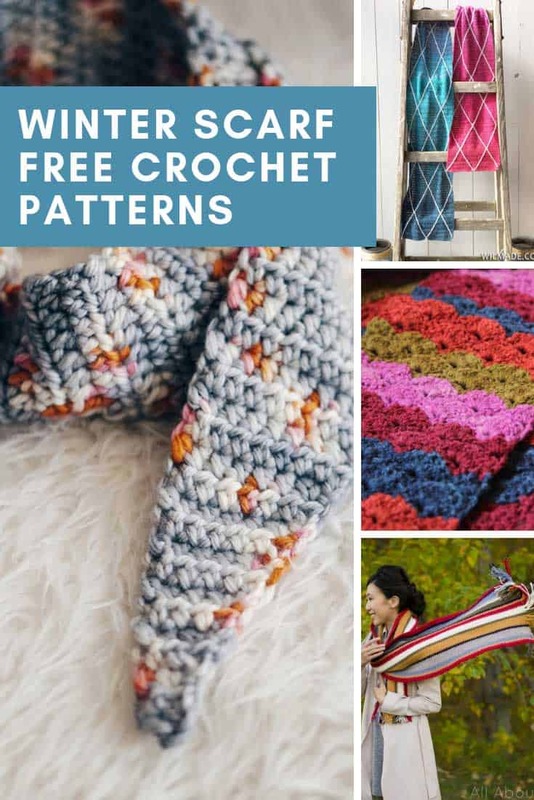 Your next project is on this list because these crochet winter scarf patterns are GORGEOUS and will keep you warm and cozy! Every Monday afternoon I take my kids horse riding on what must be the coldest, windiest field in the world! My neck gets so cold I decided it was time to crochet a warm cozy scarf! 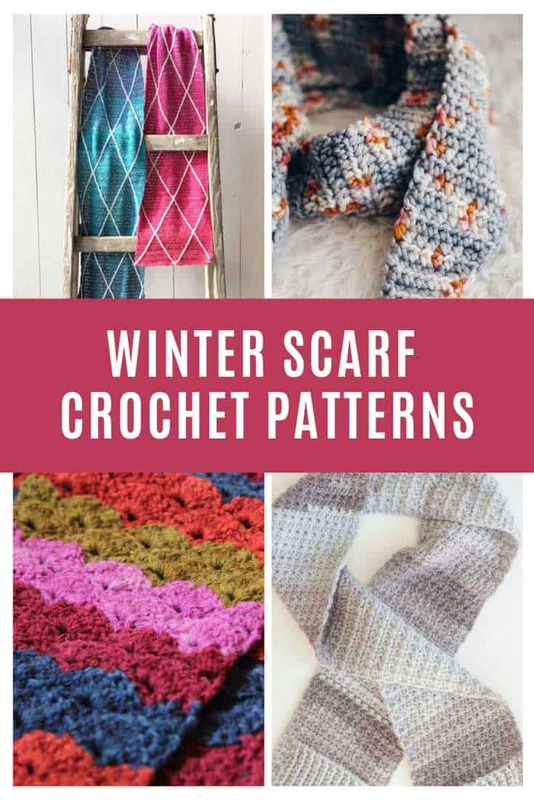 And boy did I find so many CUTE crochet winter scarf patterns to choose from, I thought I’d better share them with you too! 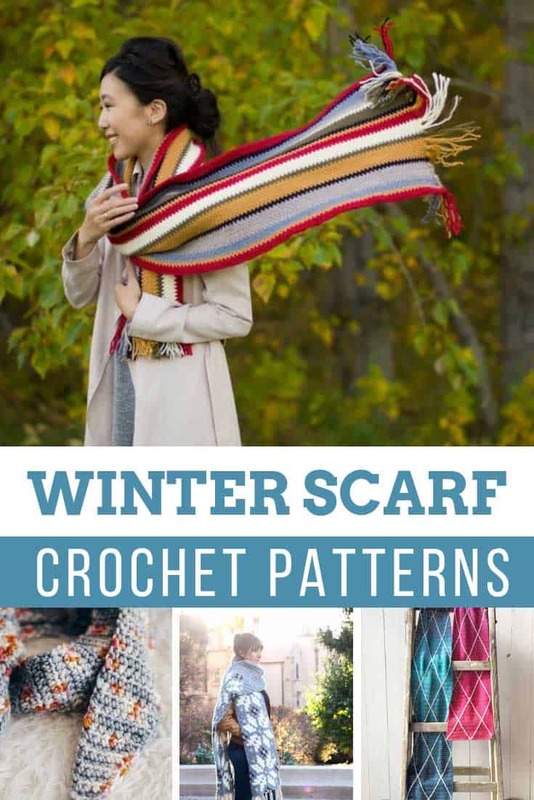 All of the scarves in this collection are your traditional “rectangle” scarf, if you prefer the cowl variety you need to take a look at our infinity scarf crochet patterns collection instead. This scarf is just beautiful with those vibrant colors and that white diamond overlay! It’s actually a simpler pattern than it looks, made with double crochet stitches, and there’s no color joining needed because it’s made with a self-striping yarn cake. If you can never remember where you’ve left your gloves this is the scarf for you… because it comes with built in pockets! Oh my I think this is my FAVORITE scarf in this whole collection, and the project I’ll be adding to my list! I love the shape of it and the colorway of that Delicious Yarn is just perfect! Oh and it’s super duper soft too which is just what a scarf should be! 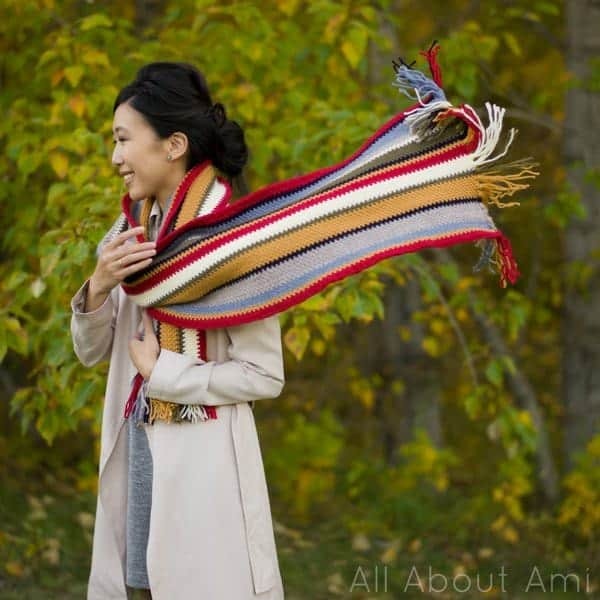 If you like your scarves with stripes, and a fringe and long enough to wrap around you over and over then this is your project right here! And it totally made me think of Doctor Who when I saw it! I know y’all love some scrap yarn projects to make sure none of that gorgeous wool goes to waste. 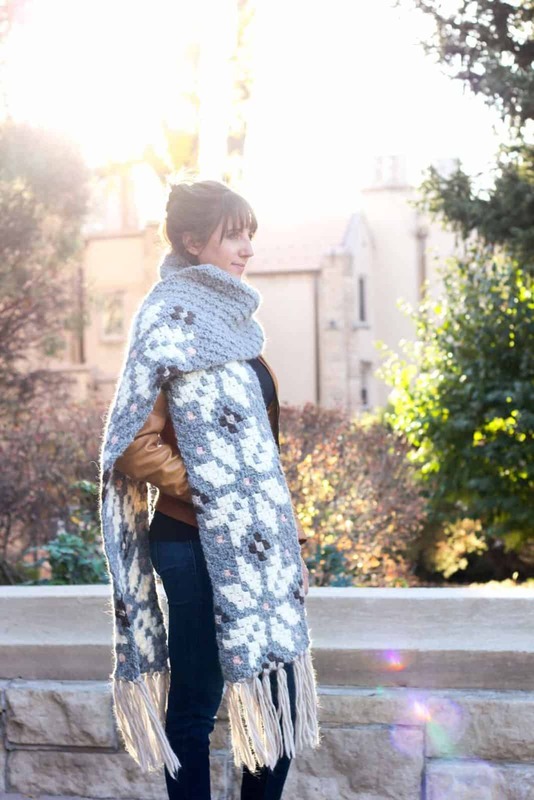 So how about this FABULOUS scallop scarf that’s made from scraps? 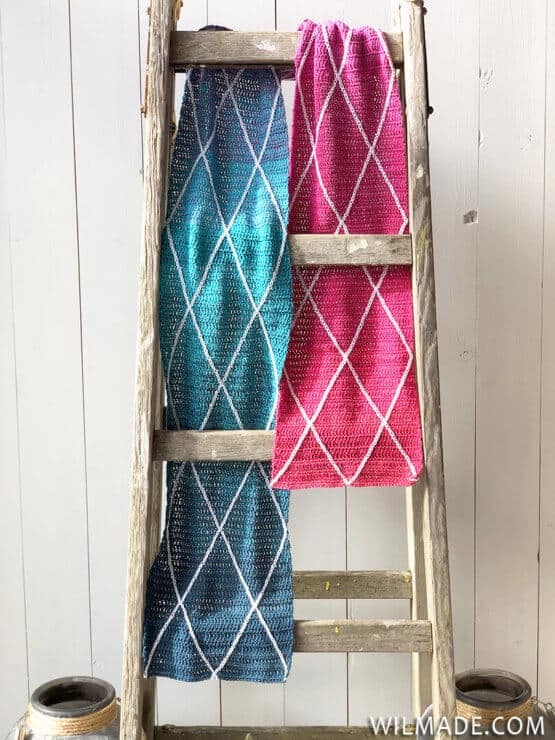 I love this one because that scallop pattern is so elegant and I think this would make a beautiful handmade gift for a friend or loved one on your list. You know those super cold days, when your nose feels like ice and you daren’t stand still in case you freeze on the spot? On those days you totally need THIS scarf! Oh my, it’s so long, and warm and cozy looking. But that nordic pattern and that knotted fringe is something SPECIAL. Seriously this looks like a scarf you would have to spend a lot of money on in some designer store! 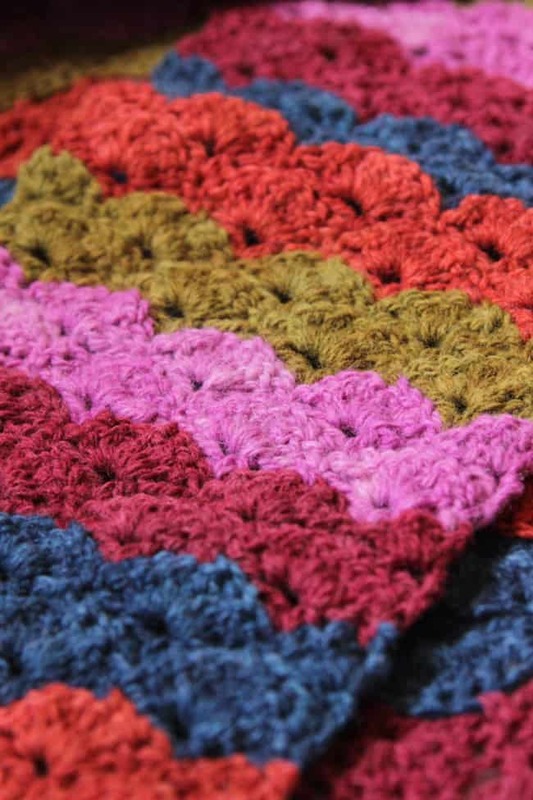 It’s a corner to corner crochet pattern, which is kinda like painting by numbers. If you’ve never tried a C2C project before this one does include a handy photo tutorial to help you read the graph as well as a video tutorial to get you started! 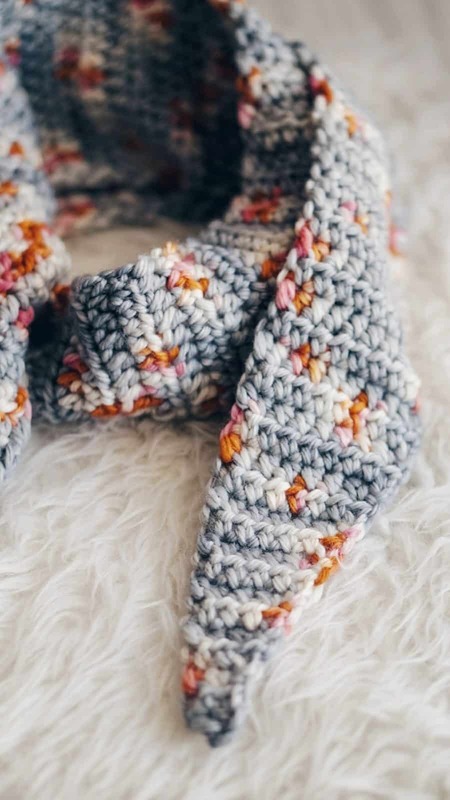 7 | How to Crochet a Beginner’s Ribbed Scarf! 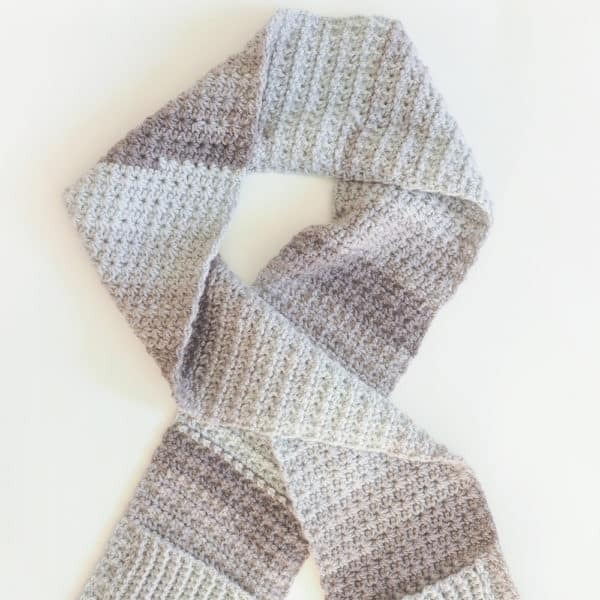 Speaking of video tutorials here’s one that’s perfect for beginners that will walk you through making a beautiful ribbed scarf. 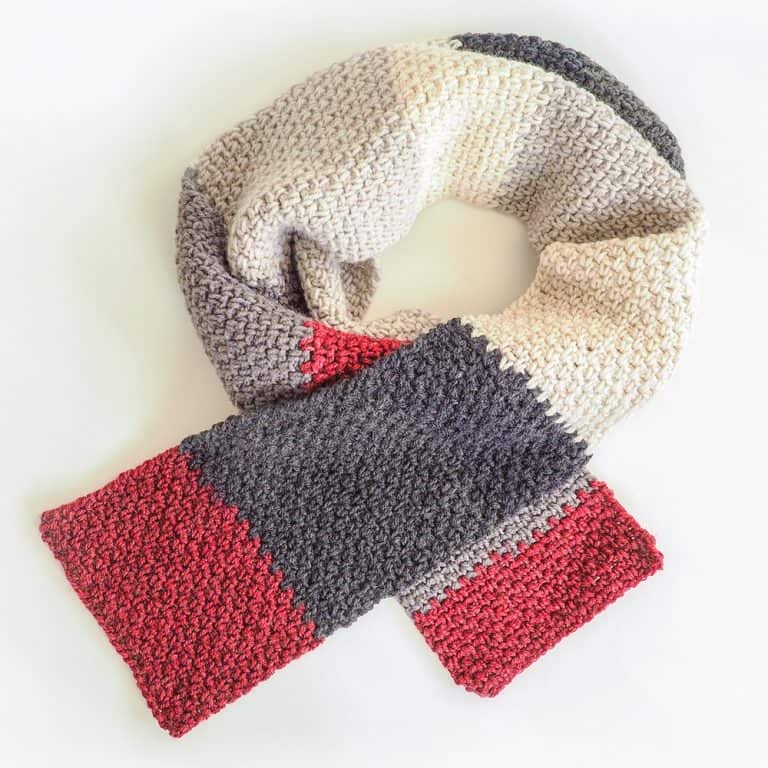 When I started searching for winter scarf patterns I was looking ones for women, but men need scarves too right so I thought I’d throw this one into the mix! It has a detailed ribbed stitch so it looks very distinguished and I love the colour choice, which again is from a hot cake so you don’t have to worry about changing colours as you crochet.